American Black & Tan Coonhound Rescue (ABTCR) is a not-for-profit association that’s been in continuous operation for a decade, and we congratulate them on celebrating their 10th anniversary this year! In their many years of operation, ABTCR has helped to rescue and find forever homes for untold numbers of hounds, not just locally but all across the nation. In fact, there are so many coonhounds available, you must first enter a geographic region to narrow searches of their site to see a list of adoptable dogs. But don't worry, they have a National Adoption Coordinator who helps keep track of everything. Keep in mind that they will help arrange transport by ground or air for approved adopters, so prospective pet parents don't have to limit their search to one specific region. At any given time, this group provides essential daily care for dozens of Bloodhounds and Coonhounds, covering the costs of all veterinary expenses. They also pay for food costs on behalf of fosterers whenever possible. Achieving so much with so little, this is an excellent group of life savers – all of them deserving of a little extra financial assistance. Their hounds come from a variety of heartbreaking backgrounds. Some are relinquished to shelters, others are abandoned in the wild. Irresponsible breeders have been known to dump entire litters if the puppies don’t sell quickly enough. For the hounds who are fortunate enough to be accepted into a shelter, many will wait a very long time before anyone pays them interest. The sad fact is, there is a common misperception that these creatures are “good for hunting but not as pets”. Nothing could be further from the truth, as coonhounds are known to be adoring, affectionate and great family dogs. Even as they work to rescue as many hounds as possible, ABTCR has also worked very hard to change the narrative concerning these loving breeds. Now that ABTCR has established a national presence, shelters all across the U.S. know to contact them regarding hounds who aren't quickly attracting prospective pet parents. ABTCR’s foster program is top-notch. All coonhounds receive superb care and veterinary attention. Thanks to ABTCR’s vigilant and dedicated team, hundreds if not thousands of hounds have been saved from a grim fate. ABTCR plans to use their financial award to help cover the costs of spay and neuter procedures for an unusually large intake of 17 dogs over a three-day period. Because their work is so outstanding, and the need was so present, the Board’s decision to fund their second application was a simple one. 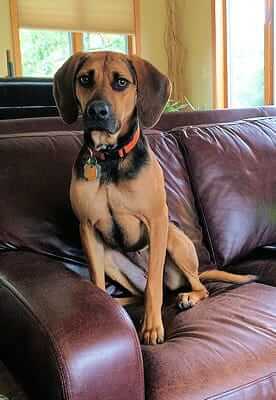 Just under a year old, Peanut is a very intelligent coonhound. She’s fully housetrained and knows how to heel, sit, down, shake and is working on mastering stay. By all accounts, she has an excellent memory (great for training) and sprints when called. Peanut loves to hang with her foster parents, is very easy-going and quite the cuddle bug. She’s curious about life, is fine with children and has even been known to hang out with cats with no problems. 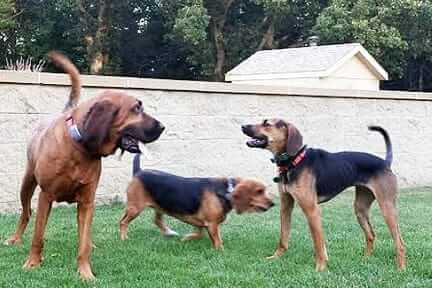 Peanut longs to be part of a pack, so she’s hoping for a home with other dogs to play with. 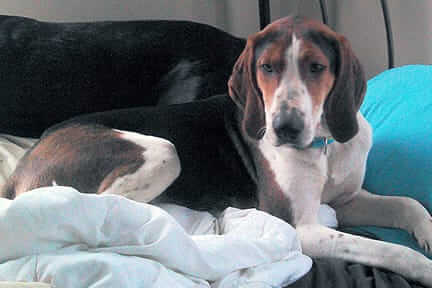 This incredibly handsome Treeing Walker Coonhound is Festus, a 3-year-old with big brown eyes and a loving disposition. Rescued from a high-kill shelter, Festus now resides in an Illinois foster home. Not at all shy, he quickly warms to new people and yearns for attention. While he’s fine with dogs and cats, Festus would be better suited to a home with no children. He enjoys playing and is ready to be a daily walker’s new best friend. 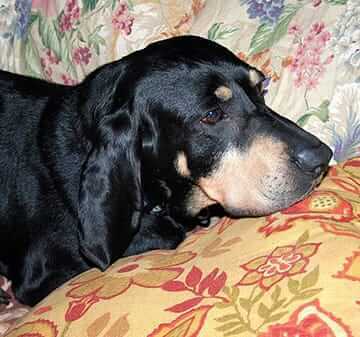 Like Festus, Boomer is also 3-year-old, but he’s a Black and Tan. When rescued, he was underweight, but will soon be his ideal weight at around 65 pounds. He is not very vocal, but his baying is described as “the most beautiful deep bass”. A gentle, adoring canine, he’s great with dogs of all sizes, including his current roommate, a 10-pound terrier who likes to steal his food! He is a bit obstinate, but is also highly sensitive to correction, so his trainer will need to be patient. Also, his adoptive parents will definitely need a crate because Boomer takes great comfort in sleeping in his own designated spot. Anyone looking for more information about this amazing rescue can visit their site at coonhoundrescue.com or email them directly at coonhoundrescuer@gmail.com. You can also e-subscribe to "The Howler", their newsletter which includes stories about hound-specific stories and dogs in general. And there’s more good news … we are still accepting applications for funding. If you know of an animal rescue organization that deserves special recognition and financial support, please encourage them to fill out an application. Download here. Thank you for all the great work you do to help and support rescue/adoption of these very deserving dogs and cats! What a wonderful organization! Thanks to the Foundation for helping them with their mission. I am always happy to learn of breed groups taking responsibility for placing their breeds with responsible dog owners when they have been abandoned for these reasons. This group definitely deserves the money that they have received from Dr. Jane's Foundation. This post give me a warm fuzzy feeling. Thanks for all that you do to help animals in need. Thank-you so much for all that you do. I'm so happy to be a part of this amazing company!